There will be four Hyundai Super Bowl 50 commercials. Today the Korean car giant released the first teaser for the company's massive Super Bowl 50 ad line-up titled "The Chase." The teaser is for a commercial featuring the 2017 Hyundai Elantra. In the 15 second teaser the car never makes an appearance. The teaser is a 15 second thrilling chase through the woods like in a low budget horror movie. 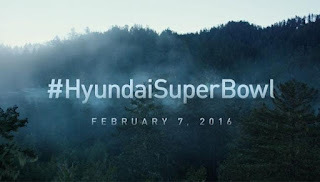 Watch the first Hyundai Super Bowl 50 Ad Teaser below. The company's luxury sedan Genesis will be showcased in one commercial, while the all-new 2017 Elantra, currently the company's best-selling vehicle, will be introduced to the public in two separate ads. Two of Hyundai's Super Bowl 50 ads will highlight the safety, technology and convenience features of the 2017 Elantra. Another commercial will showcase Hyundai's premium sedan Genesis. Genesis boasts a modern design with luxury appointments. Hyundai hired famous directors to make their 2016 Super Bowl ads. The directors working on Hyundai's ads include Peter Berg. The well-known actor, director, writer and producer will be directing two Hyundai ads. Fredrik Bond will direct Hyundai's new brand ad. Aaron Stoller will be overseeing one of Hyundai's ads. Joining Stoller in directing the ad, Janusz Kaminski is a cinematographer and film director.